If your fluffy and soft pita breads need a juicy and extra tasty companion, you have just found it! These lovely homemade Lamb Kebabs ( kofte / kofta / shish ) will definitely become the talk of your next barbecue! And the best part…they are dead simple to make. Made in only 20 minutes this traditional homemade lamb kebab recipe never fails to impress! Kebab is one of the most popular dishes in Greece, served in every tavern and for good reason. To prepare a traditional lamb kebab recipe, the minced meat is seasoned with more than ten different herbs and spices and it tastes like heaven! Kebab (also kebap or kabab) is a Middle Eastern dish of pieces of meat, fish, or vegetables roasted or grilled on a skewer or spit originating in the Middle East and later adopted in Greek cuisine. This traditional lamb kebab recipe from Constantinoupoli is one of the brightest examples of the influence of the Turkish cuisine in lots of popular Greek dishes. 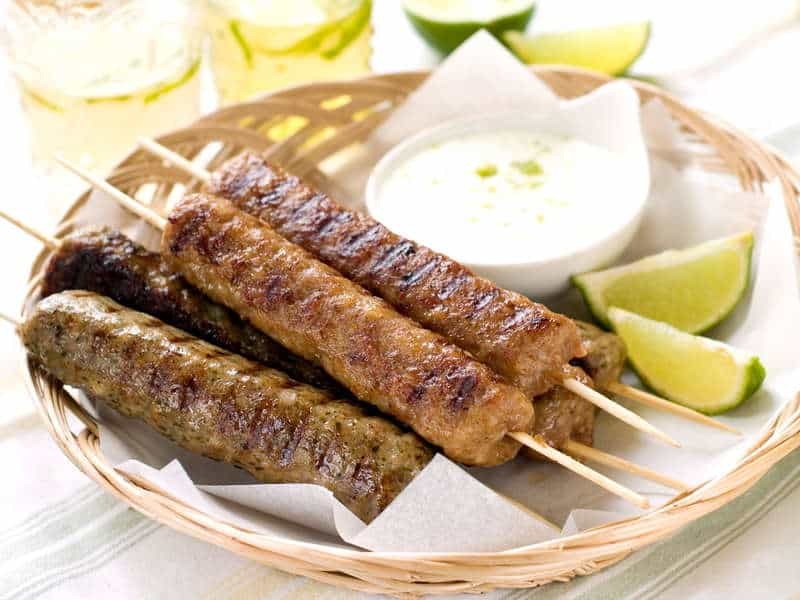 However in Greece most lamb kebab recipes are prepared with ground meat formed in oblong shaped burgers around a skewer. The rest types of “meat-on-skewer” are called souvlaki or chopped meat, called gyros. Lamb Kebabs owe their unique distinctive flavour and taste to the aggressive seasoning of the meat (for this lamb kebab recipe more than 10 different herbs and spices are being used!). So the kebabs can become a little bit heavy. To avoid this, a little trick used in this lamb kebab recipe is to sauté the onions and garlic before adding them in the ground meat mixture, so that the aromas are more gentle and discreet. Traditionally, lamb kebabs have a completely different texture than common burgers. For the perfect burgers, the meat mixture shouldn’t be overworked so that they remain fluffy. However the kebabs are tight and firm, but still juicy. To achieve this when preparing a traditional lamb kebab recipe, the ground meat is seasoned with spices and then cut in little pieces with two knives or ‘baldades’, to allow the spices to infuse the meat and form almost a ground meat paste. This procedure can be done at home by using a food processor and pulsing the ground meat for 10-15 seconds, until the meat is very finely chopped and the spices penetrate the meat. If you prefer your lamb kebabs to be fluffier (like a burger) mix the ingredients using your hands. For this lamb kebab recipe you can either go with lamb or a combination of lamb and beef (a little fat is necessary for extra flavour!). Of course the best option is to grill the lamb kebabs on a char-coal barbecue, to get them all crunchy and smokey. However they also work great on a grill pan or in the oven, if you don’t have the time or space for a proper barbecue. Enjoy! To prepare this lamb kebab recipe, heat a saucepan over medium high heat, add the olive oil, the chopped onion and garlic and sauté, until tender. In the meantime, add in a large bowl the minced meat, the spices and the tomato puree. Season well with salt and pepper and mix the mixture well, squeezing the ingredients with your hands (or a food processor). Add the chopped parsley and the sautéed onions and garlic. Using your hands mix all the ingredients together until combined. Place the mixture for the lamb kebabs in a bowl, cover with plastic wrap and leave in the fridge to rest for 1 hour. (If you have the time it’s best to leave the kebabs in the fridge overnight). To assemble the lamb kebabs, cut the wooden skewers to fit your griddle pan and soak them in water. (This will prevent them from burning). Gently squeeze the meat around the skewers to form log-shaped kebabs, each about 10-12cm long. Make sure the meat is spread to an even thickness. Refrigerate the kebabs until you are ready to grill. If you have time, it is best to chill 30 minutes to let flavours mingle and firm up meat. (The ingredients for this lamb kebab recipe are enough for 8 skewers). Preheat a grill or griddle pan on a high heat. Brush the lamb kebabs with live oil and cook for about 8 to 10 minutes, turning occasionally, until nicely coloured on all sides and cooked through. While your lamb kebabs are cooking, prepare the pita breads. Preheat the oven to 250C. Use a cooking brush to lightly oil the pita breads on both sides and season with salt and oregano. Place a large oven tray at the bottom of the oven and place the pita breads on top of the tray. Bake for 2-3 minutes. In Greece there are a lot of variations of this lamb kebab recipe. Lamb kebabs are commonly served in a pita bread and garnished with a tomato-based sauce and yogurt (kebab giaourtlou on pita bread). This version is definitely worth the extra time! To prepare the tomato sauce for the lamb kebabs melt the butter in a sauce pan, add the chopped tomatoes, the garlic and seasoning and simmer for 5-10 minutes. Layer a pita bread on a plate, top with the lamb kebabs, add two full spoons of the tomato sauce, 1 tbsp yogurt and garnish with sliced red onions. Another delicious alternative of this lamb kebab recipe is to serve the lamb kebabs with roast peppers and tomatoes and a full spoon of yogurt seasoned with a pinch of cumin, salt, pepper and lemon zest. Grill the peppers and tomatoes on a gridle pan over high heat to get them all nicely coloured and finish in the oven along with the kebabs for extra flavour. Least but not last, my personal favourite is to enjoy the lamb kebabs with some extra garlicky tzatziki sauce, pita breads and a nice refreshing Greek feta salad. So go ahead, prepare his traditional lamb kebab recipe for your friends and family and enjoy over a glass of cold beer! First of all konstantinoupoli is the Greek name for today’s Istanbul and Greeks lived way before the turks invaded the area so the food you see in turkey minus the heat of dome spices its all Greek the influence is the other way around some name borrowing from both is common but….turks dont eat pork (Muslims)so Donner its either beef or lamb, gyro its pork almost everywhere in Greece along with chicken and sometimes lamb so some of the info is wrong also Greeks lived in eastern Turkey before the turks invaded the area adopting many Greek dishes in the Turkish cuisine today and the Greeks did the same that’s why you see similarities in Italian Greek and Turkish food. It’s unfortunate that misinformation is so often repeated (especially concerning a culture as historic as the Greek culture) without people looking into the true background.